I hope you had a good day and are now ready to continue our exploration into the information on cosmetics labels. Last time we stopped after point 3. So, allons-y! If you haven’t read the first part yet, you can find it here. What’s the use? Well, like I said above, cosmetics need to be kept track of. Suppose the manufacturer finds out that something isn’t right about a product from batch A, or it’s contaminated with bacteria, or any kind of problem. This way, he could immediately alert his retailers and take back all the products from batch A, in order to warrant the consumers’ safety. 5) The minimal shelf life, also known as the “best before …” date, for products that expire in less than 30 months. For things that last longer than 30 months, there’s the PaO. 6) The period after opening, or PAO, is the optimal usage time frame for the consumer. It’s safe to use the product within the indicated period. 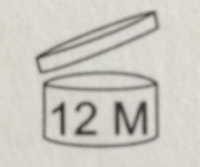 The PAO is indicated with a symbol (an opened jar) with an indication of the time on it in months. For example: 12M – this product will continue to meet general safety guidelines and will not deteriorate under normal storage conditions for 12 months after opening. The calculation of the minimal shelf life or PAO is based on the results of bacteriological tests, the product’s contents, etcetera. Note however that this is an estimate and not a law of nature; it’s possible to have a badly preserved product that’s become unsuitable for consumption, even if the PAO hasn’t expired yet… this happens to sunblock that’s often exposed to the sun and to temperatures that destabilize the emulsion, diminishing their protective power. 7) The product’s usage warnings: some products need specific instructions or warnings like “avoid eye contact” or “do not swallow”. At first sight, it seems like they think their consumers are completely stupid… But actually, this is mostly for legal reasons, to protect the company from lawsuits. 8) The purpose of the product, indicating whether it’s a facial moisturiser, or a serum, etcetera. It’s usually a good idea to avoid rubbing depilatory cream on your face instead of your night cream… you’d have a surprise in the morning. 9) The product’s ingredients: ah, there we go… incomprehensible Latin names? Swearwords? Nope, it’s just the list of ingredients, sorted by quantity in descending order. The higher up an ingredient is listed, the more important its proportion… If there’s not enough space for a full list, it needs to be marked with a note or a label with a logo on it (an open book). Ingredients with a concentration below 1% can be listed in any order after those with a concentration above 1%. Keep that in mind so you won’t be tricked! For example: hyaluronic acid with a concentration of 0.01% can be listed before xanthan gum with a concentration of 0.8%. 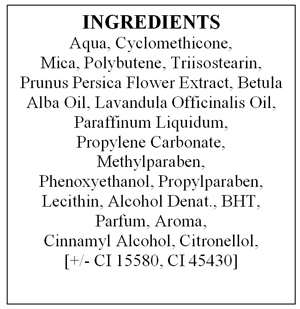 The ingredient names that may sound incomprehensible to you derive their terminology from a dictionary called the INCI (International Nomenclature of Cosmetic Ingredients). This is the famous INCI list that you always hear about in news about cosmetics (to use during a fancy dinner to show off a bit LOL…). Finally, scent and aroma compounds are only listed with names like “scent” and “aroma”, unless they contain substances that are listed as being able to cause allergic reactions for some susceptible users, all for the consumers’ protection. See!! the things they’ll do for you guys. Some of these substances are synthetic, others derive from natural ingredients (for example, geraniol is found in rose oil and geranium oil). As far as I know, it’s not obligatory yet to indicate whether ingredients are natural or synthetic… let’s keep an eye out. If you have any questions, you know the drill. P.S. : I’ve thought for a long time about showing you a photo of my pimples and skin irritations, and finally decided not to inflict that kind of visual torture on you. Consider yourselves lucky! I’m such a good guy.